The iMag Pro mobile reader is an encryption-capable magnetic stripe reader for iPad®, iPhone® 4/4S, and iPod touch® devices. Use it to read credit cards, signature debit cards, gift cards, loyalty cards, driver's licenses, and ID badges. The iMag reads up to 3 tracks of card information with a single swipe in either direction. The snug fit design was built for comfort and mobility, allowing you to accept credit card transactions wherever you go. Includes optional iPad clip. Merchant account and compatible app is required to accept credit cards. 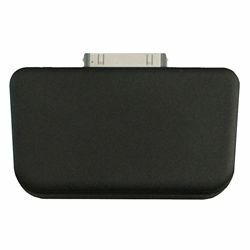 Please see documentation or www.idtechproducts.com for compatible apps. iOS devices shown not included.